Boasting over 150,000 square feet of amenities integrated into the natural landscape with shimmering lakes and streams, this 55+ community has it all. As a golf-cart-friendly community, most residents enjoy the convenience of this primary mode of transportation to and from the amenities and throughout Solivita. The largest of the community's amenities, the Riviera Spa and Fitness Center, is a 32,000 square-foot facility featuring an indoor walking track above an indoor heated lap and exercise pool. The state-of-the-art exercise room includes a modern cardiovascular suite, strength equipment, and free weights. The dance studio offers a variety of classes each week in aerobics, yoga, Zumba, stretch, and more. This active adult community offers an exclusive FIT Program that is a free fitness initiative designed for 55-plus residents who are looking to become more active or perhaps take their training to the next level. Year-round specially trained and certified trainers and staff are on-hand to help you reach your goals. Enjoy the great Florida weather with an outdoor heated pool and two heated whirlpools located on the spacious pool deck overlooking the surrounding waterways. The Palms Amenity Complex is a 19,000 square-foot building located on more than four acres. This complete fitness center is equipped with the finest gym technology, as well as a full-time professionally trained fitness team and staff. The 3,200 square-foot aerobics studio features hardwood floors and hosts weekly fitness classes. Outdoor amenities include a combination splash and lap heated pool, two heated whirlpool spas, expansive brick paver sun deck, and fireplace piazza. Outdoor sport complexes expand to include two lighted Bocce courts, four lighted Pickleball courts and two lighted Har-Tru tennis courts. This facility also houses a resident business center, multipurpose room with flexible sections, and a catering kitchen. The Starlite Ballroom is a perfect location for your next party or event. This entertainment facility can be used for small or large parties, events, or meetings. It can also be sub-divided into smaller rooms for meetings, games, or private events. The Waterfront Galleries is a bright, airy two-story studio that houses arts, crafts, and games. The building features beautiful scenic views of the lake so residents can feel inspired by nature while creating their own art work. This art center includes studios for ceramics, sculpture and painting, a billiards and darts gallery, three computer labs, and a well-appointed library. The newly renovated Freedom Park is a large outdoor recreational sports complex with a softball diamond, horseshoe pits, bocce courts, pickleball courts, and outdoor pavilions for private and community events. Many of the residents gather here for sport or to cheer on their neighbors. For the four-legged residents, the newly extended dog park offers a shady fenced in area with water fountains. The semi-private Stonegate Golf Club in Solivita includes two championship 18-hole golf courses. The Oaks, designed by Ron Garl, is named for the hundred year old oak hammocks that border this 4,300-acre course. Lush fauna and shimmering lakes and streams make up this stunning course. Equally amazing, the Cypress course can prove challenging to even the most experienced golfer. The Solivita Golf Club also includes a pro shop, practice facilities, aquatic driving range, as well as men’s and women’s locker rooms. The Stonegate Grille overlooks the finishing holes of the Stonegate Golf Club serving exquisite cuisine and refreshing cocktails. There are also the Marketplace Bistro and Mosaics restaurants that offer plenty of appetizing menu options for residents. Arranged in a collection of welcoming neighborhoods, homebuyers in Solivita can choose from a variety of different Tuscan-inspired models. AV Homes designed these models to encompass Florida retirement living at its finest. Expansive great rooms, gourmet kitchens, spa-like bathrooms, and inviting outdoor spaces are characteristics found throughout most of the homes for sale as new construction or on a resale basis. There are attached models arranged in duplex configurations that range in size from 1,361 to 2,241 square feet. These models include two to three bedrooms and two to two-and-a-half baths. The duplexes come with a one-and-a-half-car garage. There are plenty of single-family floor plans that range in size from 891 to 3,057 square feet. These desirable homes include one to four bedrooms, one to three-and-a-half baths, and one-and-a-half to three-car garages. Choices include a variety of new construction homes as well as resale only collections that were built prior to 2012. Some of the home designs include open floor plans, gourmet kitchens, stunning great rooms, spacious master suites, and the finest in outdoor living. Some of the collections showcase features such as brick paver driveways, matching entry walks, and modern kitchen appliances. Creating a lifestyle unmatched by any other active adult communities, Solivita offers a truly unique experience. Every week there are dozens of classes to choose from, enriching the mind and strengthening the body. Classes like ballroom dancing, relaxation, tai chi, oil painting, pottery, and calligraphy are just a sample of the many possibilities as a resident. With a full-time Activities Director and Lifestyles Team, residents’ schedules are packed with fun, new, and exciting events and activities from day trips and guest speakers to festivals and dances. The more than 150 resident social clubs and interest groups add to this community's small town ambiance and make the most difficult choice deciding how busy you’d like to be. With several major highways close-by connecting to the greater Central Florida area, Solivita in Kissimmee, Florida is in a premier location. The award-winning gated community continues to rank top-of-the-charts for active adult communities with their dedication to creating a fantastic lifestyle that is built around the homebuyer. Some of the nearby attractions include Universal Studios, Lakeridge Winery & Vineyards, Kennedy Space Center, and Amway Center. Located just 40 minutes from Walt Disney World and Orlando International Airport, and minutes from charming downtown Kissimmee, Solivita is a great place to call home. An upscale resort-amenity complex that is the central hub of activities. Palms Amenity Complex - 19,000 Sq. Ft.
An expansive spa and fitness center with state-of-the-art equipment. Riviera Spa & Fitness Center - 32,000 Sq. Ft. The Waterfront Galleries is an art center that provides space for socializing and working on creative projects. Waterfront Galleries - 16,000 Sq. Ft. The Starlite Ballroom is a great space for entertaining or hosting large or small events. The ballroom can be sub-divided into smaller rooms for a variety of meetings, events, and parties. Starlite Ballroom - 17,000 Sq. Ft.
A neighborhood center with a variety of amenities. Venezia Neighborhood Center - 3,200 Sq. Ft.
Bella Viana Neighborhood Center - 3,200 Sq. Ft. Residents can enjoy this semi-private golf club with two golf courses. Membership is optional. An 18-acre sports complex with outdoor amenities and recreation. There are plenty of activities available in Solivita. Here is a sample of some of the clubs, activities and classes offered here. The attached homes in the Courtyards Collection offer 1,361 to 1,481 square feet of living space. These homes feature two bedrooms, two bathrooms, and a one-and-a-half-car garage. These homes are available as new construction. The attached models in this collection are resale only. They range from 1,498 to 2,241 square feet. They feature two to three bedrooms, two to two-and-a-half bathrooms, and a one-and-a-half-car garage. The single-family models in this collection are available as resale only. These homes range from 891 square feet to 1,398 square feet. They have one to two bedrooms, one to two bathrooms, and one-and-a-half to two-car garages. Please Note: Not all floor plans are available at this time. Single-family models in this collection are available on a resale-only basis. They range in size from 1,086 to 1,505 square feet. These homes have two bedrooms, one-and-a-half to two bathrooms, and an attached two-car garage. These single-family models are available on a resale-only basis. These homes range from 1,285 to 1,625 square feet of living space. They have two to three bedrooms, two bathrooms, and an attached two-car garage. The models in this collection are all resale homes that range from 1,314 to 1,826 square feet of living space. These homes have two to three bedrooms, two bathrooms, and an attached two-car garage. Single-family homes in this collection are available on a resale-only basis. These homes range in size from 1,319 to 1,608 square feet and feature two to three bedrooms, two bathrooms, and an attached two-car garage. The Sabal Collection is available on a resale-only basis. These single-family homes range from 1,359 to 1,615 square feet. These homes have two bedrooms, two baths, and two-and-a-half-car garages. The Gulfshore Collection models are all resale homes that range from 1,545 to 2,343 square feet. These homes have two to three bedrooms, two to two-and-a-half baths, and an attached two-car garage. The models in this collection are available on a resale-only basis. These single-family homes range from 1,552 to 2,032 square feet. These homes feature two to three bedrooms, two bathrooms, and a two-car garage. The Garden Collection ranges in size from 1,583 square feet to 1,719 square feet. These single-family homes feature two bedrooms, a den, two bathrooms, and one to two-car garages. These homes are available as new construction. The Queen Palm Collection is available on a resale-only basis. These single-family homes range in size from 1,597 to 2,112 square feet. These homes have two bedrooms, a den, two to two-and-a-half bathrooms, and two to two-and-a-half-car garages. The models in the Gold Coast Collection are all resale homes. These homes offer from 1,676 to 2,342 square feet of living space. These homes have two bedrooms, a den, two to two-and-a-half bathrooms, and two-car garages. The Classic Collection features two to three bedrooms, two to two-and-a-half bathrooms, and an attached two-car garage. These homes range in size from 1,707 to 2,259 square feet of living space and available as new construction. The models in the Classical Collection are available as resale only. These homes range from 1,714 to 2,317 square feet. These single-family homes have two to three bedrooms, two to three bathrooms, and an attached two to two-and-a-half-car garage. The single-family models in this collection are available as resale only. These single-family homes range from 2,105 to 2,343 square feet and feature two to three bedrooms, two to three baths, and two to two-and-a-half-car garages. The single-family homes in the Royal Palms Collection are available as resale. These homes range from 2,108 to 2,462 square feet and feature two to three bedrooms, two-and-a-half to three bathrooms, and a two-and-a-half-car garage. The Estate Collection offers spacious floor plans ranging from 2,183 square feet to 2,737 square feet. These single-family homes feature two to four bedrooms, two to three bathrooms, and two to three-car garages. These homes are available as new construction. The Symphony Collection is made up of single-family homes and are available as resale only. These homes range from 2,274 to 2,701 square feet and have three bedrooms, two to three bathrooms, and an attached two-car garage. Single-family homes in the Majestic Palm Collection feature two to three bedrooms, two-and-a-half to three-and-a-half bathrooms, and two-and-a-half-car garages. These homes range in size 2,331 square feet to 3,057 square feet. These homes are available as resale only. The Tuscany Collection models are single-family homes and available as resale only. They range from 2,275 to 3,000 square feet and feature two to three bedrooms, two to three baths, and a three-car garage. These single-family homes are available as resale only. They range in size from 2,471 to 2,983 square feet and feature three to four bedrooms, three to four-and-a-half bathrooms, and two to three-car garages. The models in this collection are available as resale only. They range from 2,545 to 2,980 square feet. These single-family homes have three to four bedrooms, three to three-and-a-half baths, and two to three-car garages. Everything is organized with plenty of resources. The amenities are plentiful. The community is clean & very well maintained. We look forward to living here! Beautiful, well constructed energy efficient homes. Beautifully landscaped. Over 200 clubs/activities. Warm climate. I have been living in Solivita for the past 8 years. Every day I wake up I feel like I am on a vacation. Made many new friends and became involved in lots of clubs and volunteer groups. I visit the gym three or four times a week and enjoy long walks every morning enjoying the beautiful scenery. Love riding our golf cart around the development and just going at a slower pace. Solivita is my little bit of heaven, so thankful we retired to such a wonderful place. I moved to Solivita 10 years ago and am so glad I found the community. It's amenities and social life (more than 100 clubs) provide many opportunities for fun. It's proximity to Disney (just about 40 minutes away) is a great benefit if you enjoy the parks. Homes are affordable and there are a lot of models to choose from either by building new or buying a resale. Yes it's off the main roads, but that's why I chose it. We're close enough to all the Orlando area has to offer, but far enough away to have clean air and beautiful surroundings. My wife and I moved here in 2008. I am retired, she is still working. When the Poinciana Medical Center opened across the street, it made her commute a lot shorter (she's a RN). With over a 100 clubs, you can be as active as you like. There are many neighborhood pools, an indoor pool, 2 gyms, tennis courts, bocce courts, pickle ball, shuffle board, horse shoes, baseball and of course golf. Lifestyles schedules great shows. Publix and Walmart are close by. They have a farmers market on Monday and Friday. Saw "The Jersey Boys" at the Bob Carr in Orlando, a short drive away. Both coasts are about an hour and a half from here, Great place to live! We moved in a month ago and are very happy. The grounds are beautiful, facilities well-maintained. The golf courses are excellent. There is so much to do, and you can chose as many activities or as little as you wish. 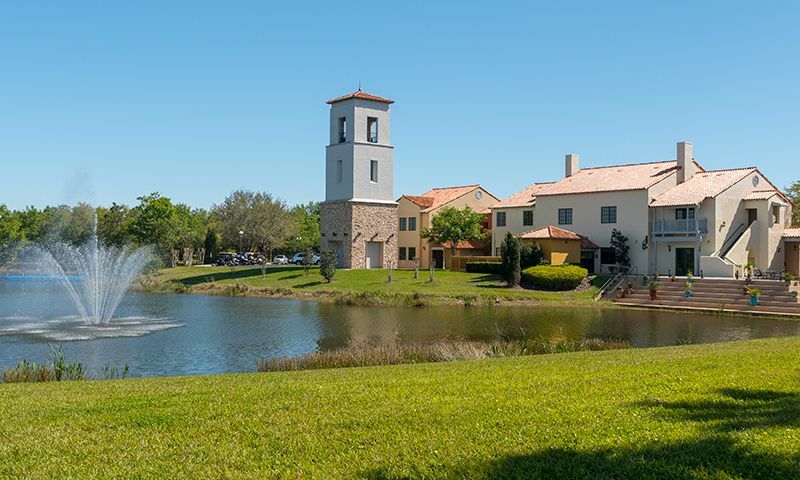 We would highly recommend Solivita to anyone considering a 55+ community in central FL. Kudos to our 55 Places Partner Agent for her assistance in finding our new home. She was great! We just recently moved to Solivita after being in another park that was small nearby. My husband was looking forward to being on a golf course and I was looking forward to having more things to do. I first researched other places between Atlanta and Orlando and we spent the whole fall and winter looking at places. We narrowed it down to two places and then decided what made Solivita stand out the most was it's beauty and affordability. It is a beautiful place and we love our house. The added bonus is that there are just so many things to do a person could get overwhelmed. There is something for everyone. You can be as active and social as you want to be. I found 55places.com by searching on the internet and found our realtor here as well. Our 55 Places Partner Agent was the best kind of realtor, she showed us houses and was very helpful but not pushy in any way. A friend of ours referred to Solivita as a little piece of heaven. Well, Solivita is probably not heaven but it sure seems to be a place where you can keep growing as you age and do it gracefully. Great place pristine environment best planned community I have seen in a long time. The only negative is the absence of good grocery stores in the area. We moved here from California 3 years ago to retire young and feel blessed each and every day. It is such a beautiful resort place to live. We are very involved in exercise classes, Zumba, softball, pickle ball, and bicycle riding. Solivita maintenance crew work endlessly to keep everything looking so beautiful. We have met so many wonderful life-long friends through the numerous social functions. We love to take evening rides on our golf cart with our dog Foster. Retirement has become more than I could ever imagined because we chose SOLIVITA. When moving here six and a half years ago I had doubts about all that I read as to expections about living here. It didnt take me long to realize that everything that was promised was true. The two main pools were more than expected. Golf courses were extremely well kept. Grounds well maintained. The many clubs are a sign that everyone could could enjoy their personnal needs. Have been more than happy to be a resident. 55places.com is not affiliated with the developer(s) or homeowners association of Solivita. The information you submit is distributed to a 55places.com Partner Agent, who is a licensed real estate agent. The information regarding Solivita has not been verified or approved by the developer or homeowners association. Please verify all information prior to purchasing. 55places.com is not responsible for any errors regarding the information displayed on this website.